You can read the full text of The First Inning below, or, to see it as it appears in the book you can download it in Adobe Acrobat format. The recording industry never saw it coming. It was used to format changes, having successfully weathered the transitions from vinyl to tape to compact discs. But it was shocked and surprised by the rise of the digitized music file and the Internet as a means to buy and share music. Faced with a curveball that threatened its understanding of how its own business worked, the recording industry lashed out in anger. It blamed music listeners for sharing files. And then it actually attacked its own customers, choosing to sue individual listeners who’d traded audio files over the Internet. Rather than stepping up and addressing the curveball, the recording industry actually made things worse. Everyone—from the most seasoned CEO whose face has graced the cover of Forbes to the wet-behind-the-ears intern still trying to figure out the phone system—experiences the same immediate reaction to a curveball: shock and surprise. That’s because curveballs are, by definition, unexpected, and it’s human nature to be momentarily stunned by them. Experience minimizes the number of curveballs you strike out on, since you’re better able to anticipate them. But this same experience also guarantees that those curveballs you do strike out on have an even greater potential to create tremendous challenges, since they are so out of the ordinary. As a result, you may not be shocked and surprised as often, but when you are, the consequences can be devastating. What separates the great curveball hitters—whether in business or life—from the rest of us is what they think, feel, and do after that shock and surprise. Most people, after being shocked by a curveball, enter into a self-destructive cycle of thoughts, feelings, and behaviors that amplify the negative impacts of the surprise. We start by thinking there had to be a reason for the curveball, that there’s someone or something to blame for what happened. That attitude invariably results in feelings of shame, anger, or fear. Those feelings directly lead to behaviors like trying to hide from the reality of what has happened, striking out aggressively, or frantically flailing about in a million and one directions without any forethought. This cycle serves to make things worse, rather than better. The great curveball hitters respond to surprising events far differently. They launch into a positive, empowering cycle of thoughts, feelings, and behaviors that mitigate the negative impacts of the surprise and also position them to turn the crisis into an opportunity. They step up to the plate. While it helps if you were born with an optimistic nature or were raised to be self-confident, anyone and everyone can learn how to step up to the plate when thrown a curveball, whatever your age or career stage. Stepping up to the plate requires an understanding of what you’ve been doing wrong and what you should do instead, and the willingness to work hard at consciously breaking old attitudes and habits. Let’s start by exploring the typical self-destructive cycle into which most of us instinctively enter when thrown a curveball. When most of us are thrown a curveball, our initial thought is that it couldn’t have been random, that there had to have been some larger reason behind it all. It is very difficult for people to deal with the concept of randomness. So much of our behavior and our beliefs are based on there being an order to the universe—that if we act in certain ways, certain things will happen as a result. Randomness calls into question not just our own control over our lives, but many of the rules we live by. That’s why we almost instinctively reject the possibility that we’re neither in control of nor responsible for the events in our lives. For many, the first answer is: “Me. I must have screwed up.” We think that, because we didn’t see it coming, we must somehow be at fault. “Did I miss the signs? Was I distracted? Was it something I did, or something I didn’t do?” There may actually be some truth in this. You may have missed something. But whether it’s true or not, thinking this won’t help you deal with the current situation. If you have a particularly poor self-image, you may get bogged down in this blame game and keep beating yourself up. Those of us who have a decent self-image will soon tire of self-abuse and will start to look elsewhere: if it wasn’t us, it had to be someone or something else that’s to blame. The search for an outside villain follows self-criticism as frequently as night follows day. “My superior singled me out unfairly. It’s our stockbroker’s fault that our portfolio took a hit. It’s the fault of the field sales force that our numbers are down.” This happens at every level of society, from the kid whose Little League team loses a game to the congressional representative confronting an unprecedented global financial crisis. And just as there may have been some truth to initial thoughts of personal responsibility, pinning the blame on something or someone else might turn out to be accurate as well. For instance, your boss may well have unfairly singled you out. So how does that change the situation at hand? Not much. Pinpointing an external cause may be a natural reaction to the unexpected, but it is no more productive than rightly blaming yourself. That doesn’t mean you shouldn’t eventually try to figure out why you were surprised. The time for this, however, is after your recovery effort is well under way. Postmortems are indeed excellent tools for helping avoid future problems. A good, honest, nonvindictive after-the-fact assessment could go a long way to minimizing the number of curveballs you or your organization will face in the future. It’s the search for someone or something to blame that’s problematic, not the search for a cause. Initially thinking that someone or something is at fault for the curveball will generate destructive feelings. Blaming yourself for not seeing a curveball coming will lead directly to feelings of shame and embarrassment. 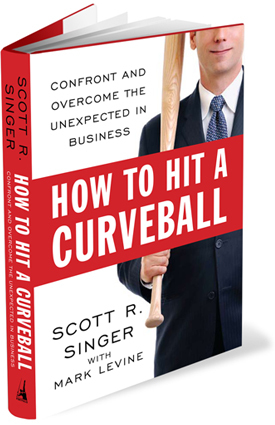 You might feel the curveball is evidence of a personal or professional failure. The certainty you feel that you’re to blame will lead you to think everyone else agrees with you. You’ll be convinced that not only do you think you’ve screwed up, but your boss, peers, and employees think you’ve screwed up as well. You’ll believe they’re actually saying the negative things you’re just thinking about yourself. And it’s not just your coworkers. While they may not know the details, you’ll be sure your family and friends share your belief that it’s all your fault. You’ll think your spouse is ashamed of you, your parents embarrassed by you, and your kids humiliated by your failure. Blaming others, rather than yourself, for a curveball won’t result in any prettier a picture. Instead of shame and embarrassment, you’ll feel anger and resentment. Having singled out a culprit, you’ll attach to him or her all the negative results, real or just imagined, from the curveball. They won’t just be, let’s say, the cause of your losing a client; they’ll become the cause of your losing your job, of your child not being able to go to the college of his or her choice, and on and on. As your anger builds, you’ll resent others for not feeling as angry, the culprit for not being sufficiently apologetic, and the universe for having done this to you. It’s perfectly understandable to feel fear when thrown a curveball. After all, the results of the situation may well be traumatic, perhaps even life-threatening. You could be facing unemployment in a down economy with a pile of bills to pay. You might be confronting a near catastrophic loss of revenue for your business at a time when expenses are climbing. And if you’ve been thrown a personal curveball, you might even be staring death in the face. Fear in such circumstances isn’t just understandable, it’s justified. In baseball, when a batter is afraid of getting hit by a pitch, he pulls away from the plate by stepping with his front leg toward the foul line, rather than striding forward. It’s called “putting your foot in the bucket.” This refers to the bucket of drinking water once kept inside the dugout, which it appeared the batter was stepping toward. When a fastball is coming high and inside, the reaction is understandable and accepted. But when a batter is badly fooled or frightened by a curveball that seems to be coming right at him and at the last minute breaks over the plate, the action is seen as a sign of weakness and fear. The batter can expect to receive nothing but breaking balls the rest of the game, until he shows he has the courage to stay in the batter’s box and take a good swing. If he’s going to hit the curveball, he has to overcome his fear and not act on it. The same is true for anyone facing a curveball in business or life. The problem with all these feelings isn’t that they’re not justified, it’s the behaviors they often lead people to pursue. Feelings of shame, anger, and fear generally result in hiding, fi ghting, and flailing about. The most common way people respond to feelings of shame is to hide. There are hundreds of legendary stories about people hiding after being thrown a curveball. The most extreme involve businessmen who are terminated but whose shame is so great that they don’t tell anyone about it. They don’t tell their spouses what happened and instead act as if they’re still employed. They go to “the office” each day, while actually either furiously job hunting or killing time at Starbucks or a bar. Those in the deepest denial procrastinate rather than try to address their problems and, in effect, make their situation more difficult. Procrastination does nothing but lock the problem in place and, as a result, prolong pain and difficulty. In baseball, when a manager or player starts a fight with the umpire over a call, it’s called a rhubarb. When someone is angry at another after confronting a curveball, it’s common for the anger to bubble over, and the person might strike out and start a rhubarb of his or her own. Perhaps a salesman who blames his immediate superior for an unfair termination responds by telling off his boss. But the target of the rhubarb often may have had nothing to do with the curveball. Pent-up fury can be vented at innocent bystanders. The account executive angry at her client for canceling a long-planned campaign could come home and snap at her husband or children for something unrelated. There are even times when the anger takes the shape of free-floating, almost existential rage at the universe. I think that’s what happened to me after my own termination when I found myself yelling at other drivers. I wasn’t really angry at them for, say, not merging onto the highway fast enough. I was angry at the world for not treating me the way I thought I deserved to be treated. Anger is as unproductive a behavior as hiding. Getting into an argument or berating someone may give you a momentary relief. It could temporarily inflate your battered ego to assert dominance over someone else. But it will do nothing to help you overcome a curveball. Baseball managers understand this as well. They don’t run out on the field to argue with an umpire thinking they are going to get a call reversed—that never happens. The manager is yelling at the umpire to provide an outlet for his players’ frustrations in the hope that they won’t get angry and instead will focus on playing the rest of the game. Anger and lashing out does nothing to help you hit a curveball either on or off the diamond. While covering the Brooklyn Dodgers during the late 1930s and 1940s, Hall of Fame broadcaster Red Barber and Garry Schumacher, sports editor of the Brooklyn section of the New York Journal, began using the word “rhubarb” to describe a player or manager fighting with an umpire. Even though its fi rst use in baseball is known, the origin of the term itself is in great dispute. One of the more fascinating theories is that it comes from the use in Shakespeare’s time of the nonsense phrase “rhu-bar-bar” by groups of offstage actors to simulate the noise of an angry crowd. Another belief is that it came from the practice of mothers in the Greenpoint section of Brooklyn giving their boys rhubarb sandwiches, and the boys subsequently using these much disliked meals as weapons in their frequent fights. On the diamond, another common response to being surprised by a curveball is to take a wild swing at the pitch. Players who make such an inept effort are said to “swing like a rusty gate.” Flailing about in this way is the typical behavior of those who feel frightened by the curveball they’ve been thrown. Usually this involves engaging in frantic, impulsive, desperate actions. I did this too. I called everyone and anyone in my professional network as soon as I was fired. The idea was to address the superficial, short-term problem as quickly as possible. One problem with flailing about is that you’re not spending time thinking about the long-term ramifications of your actions or weighing the odds of success. If such desperate measures don’t succeed, the initial fear turns into long-term anxiety, which makes the odds of recovery even longer. That happened to me. I got a couple of immediate interviews but, as I should have known, didn’t get any offers. Frantic actions can also serve to wear you and your network down too soon. Rather than picking your spots and figuring out the best time for approaches, you put maximum pressure on yourself and your network immediately. Even if your desperate behavior succeeds in the short term, it has the potential for making long-term recovery more diffi cult. Let’s say a desperate terminated accountant lands a job as a bookkeeper. When he eventually gathers his wits and starts looking for a more appropriate position, he’ll find that he has exhausted his contacts, labeled himself as desperate, and permanently set himself back on the career ladder. In retrospect, if I had gotten a job from one of those immediate interviews, I’d probably have been in worse shape longterm, since it’s likely I would have been let go in the next round of industry-wide layoffs, which came quite quickly thereafter. Having been let go twice in short order would have sunk my spirits even lower and would have really hurt my career. Actually, all of these behaviors—hiding, fighting, and flailing about—will damage not just your chances of hitting the curveball, but your reputation. Whatever you’re feeling on the inside is sure to be expressed not just in your behaviors, but in how you’re perceived by others. Hiding will make you look pitiful, rather than gain you sympathy. Fighting won’t make you seem strong; it will make you look weak and ridiculous, like someone shaking a fist at the passing clouds. Flailing about will make you appear desperate and out of control rather than energetic. The image you’ll be sending out to the world is that of a victim. Potential employers won’t want a victim’s negativity to infect their organization. Employees won’t work to their full potential for a manager who acts like a victim. Family and friends will pity you—not express their confi dence in you. Peers will be unlikely to offer help for fear you’ll reflect poorly on them. I wasn’t unique in experiencing more than one feeling and exhibiting more than one of these normal behaviors when I was faced with the loss of my job. The feelings and behaviors of the normal coping cycle seem to come as a package. Rarely does someone experience only one feeling or exhibit only one behavior. Janet Silver (not her real name) was stunned when she found out two of the major jobs she’d booked for the fall season had fallen through. Janet is a regional sales manager for a company that sells complete high-end alternative-energy heating systems to home builders. After two successive quarters, in the winter and spring, of not meeting the sales expectations set by her boss, a demanding entrepreneur who’d founded the company, Janet felt a great deal of pressure to turn things around. And she did just that in the summer, exceeding projections and, in her boss’s words, “justifying her salary” in the process. However, a general economic downturn in the late summer led to the cancellation of two of Janet’s biggest fall projects. Janet was afraid that despite the extenuating circumstances, her job would be in jeopardy. Rather than break the news to her boss as soon as she herself learned of the situation, Janet hid the cancellations. At first, she rationalized her secrecy by telling herself that she just needed enough time to figure out how best to break the news. But as one week turned into two, her rationalization faded and was replaced by a frantic effort to quickly land new jobs to compensate for the lost deals before her boss could learn the truth. Up until the morning when she had to report the numbers to her boss, Janet was burning up the phone lines trying to generate new business. When she threw her own curveball to her boss, surprising him with the lower than expected fi gures, Janet came faceto-face with the third type of reaction: anger. David Jefferson (not his real name) is no stranger to experiencing anger in response to curveballs. He’d struggled long and hard to convince his wife to sell their downtown apartment and purchase a house in an affluent suburb. While she knew they’d be able to turn a profit on the sale of the condo and use those funds for a down payment, David’s wife was afraid their incomes weren’t sufficient to carry the larger mortgage payments they’d be facing after buying a much grander home in a more expensive area. David felt that savvy real estate investing was the only way he and his wife, who are both civil servants, would be able to move up the economic ladder quickly. After finding a home they both loved, David spent weeks working with a mortgage broker and his real estate agent until they found a mortgage deal that would enable them to make the purchase. The purchase and move went well, and after a year in their new house the Jeffersons felt like they were fi nally getting settled. But then their monthly payments began climbing dramatically, outpaced only by their gasoline bills. Since they both now had to drive to work separately rather than take mass transportation, their commuting costs soared. David’s wife kept asking him if everything was okay financially, and he kept reassuring her, hiding the truth. Finally, when she fielded a dunning call from their mortgage lender, the truth came out. David’s response wasn’t contrition. Instead, he lashed out at his wife, blaming her for the situation, saying her lack of confi dence in him was the real underlying cause of their difficulties. Neither hiding, making frantic efforts, nor lashing out helped Janet, David, or me in overcoming our curveballs. And they won’t help you either. Let go of the normal cycle of thinking there had to be a reason for the curveball; feeling shame, anger, or fear; and then hiding, striking out aggressively, or frantically flailing about without any forethought. Instead, launch into the positive, empowering cycle of thoughts, feelings, and behaviors that the great curveball hitters follow. How do you do that? Adopt the right attitude, and step up to the plate. The way to step up to the plate when thrown a curveball is to change the way you think. That might sound obvious, but it’s actually a somewhat revolutionary approach. For years, the conventional therapeutic approach to breaking out of problematic thought/feeling/behavior cycles has been to focus on your feelings. For example, a psychotherapist might talk with you about things that happened to you in the past and how they made you feel. Or a psychiatrist might talk to you about how you feel and prescribe drugs which can suppress those feelings or produce the opposite feeling. From Freud on through today, conventional psychotherapy has theorized that negative feelings lead to negative thoughts, which then lead to negative actions. The goal of conventional therapy has been to discover the deep-seated causes of those negative feelings. In the 1950s, two therapists were growing disenchanted with what they felt was a lack of effectiveness of traditional psychotherapy. Albert Ellis developed an alternative approach called Rational Emotive Behavior Therapy. At the same time, Aaron Beck came up with his own alternative approach which he called Cognitive Therapy. The simplest explanation of the combined Ellis and Beck approach, which has come to be called Cognitive Behavioral Therapy (CBT), is that negative feelings actually come from negative thoughts. Rather than seeking to discover the causes of negative feelings in the past, CBT teaches how to avoid negative thoughts in the present and future. Instead of being a longterm process of discovery, it focuses on the finite process of developing coping skills and mechanisms. Clinical trials have shown the technique to be remarkably successful in treating everything from depression to insomnia. While I don’t believe there are any clinical studies to back it up, this technique is also remarkably successful for dealing with curveballs. This is a very powerful question for a couple of reasons. First, it forces you to focus on the present, on actions to take. No time or effort is wasted on a search for reasons or scapegoats. The practical advantages of that should be obvious. There’s no witch hunt and no attempted cover-up. There’s no selfdenigration. Less apparent are the emotional and psychological effects. Concentrating on your response to the curveball forces you to accept what has happened much quicker than if you spent days, weeks, or even months going over and over the situation in your head. Second, asking “What should I do?” forces you to be active and forward-thinking rather than refl ective and defeatist. The question is not “What can I do?” Asking that could lead those with an already poor self-image to jump to the answer “nothing” and start spiraling downward. Those with a better self-image could be flooded with a million and one possible responses. When your response to a curveball is to think about what should be done, you weigh the possibilities and develop a plan. Let’s look at how the thought/feeling/behavior cycle differs when you change that initial question. Weighing possibilities and developing a plan will lead to feelings of confidence. You’ll feel empowered rather than like a victim, and this will result in positive behaviors. Instead of hiding, you’ll reach out to others. You’ll be sanguine rather than angry. And rather than flailing about, you’ll have a plan and be focused on its execution. That’s how great curveball hitters think, feel, and act. Investment banker Ryan Scott (not his real name) wasn’t just starting off in his career, but he faced an even more traumatic curveball. He was well established at a middle market–focused firm when the 2008 financial crisis hit. Ryan specialized in what had always been a very active sector with lots of merger and acquisition business. But when the economy crashed Ryan saw his potential revenue streams drying up. While his firm, unlike many of the big players, wasn’t worried about its survival, he knew he wouldn’t be able to write any business for some time. Rather than spending his time and energy blaming the economic environment, Ryan focused on what he should do to position himself for an eventual recovery. Ryan held seminars and created an e-mail newsletter. He reached out to past, present, and potential clients, providing them with projections and analysis on an almost weekly basis and offering to chat with them if they had any questions. By thinking this way, he felt in control and confident, and his resulting actions served to boost his firm’s image and position it to gain future market share. Not coincidentally, Ryan’s peers and clients were duly impressed with how he handled a curveball that had given so many others in the industry such trouble. Potentially, this kind of image enhancement can be just as important as your actual behaviors. Rather than appearing the victim, you’ll look like a hero. Family and friends will take their lead from you. Rather than responding with pity, which would contribute to your negative feelings, they’ll feel and show admiration for your composure, reinforcing those positive feelings. Employees and peers will be reassured by your confi dence and leadership. They’ll work with you to address the situation, magnifying your own efforts. Your bosses, both current and potential, will be impressed by your steeliness and focus. They’ll be more likely to view you as the solution to a current problem—or a future superstar who’ll help weather tomorrow’s curveballs—as well as a role model for others in the organization. If anyone would surely be tempted to look backward, it’s former vice president Al Gore, who, despite winning the popular vote, lost the 2000 presidential election when the Supreme Court suspended the recount in Florida. Yet the book An Inconvenient Truth, which he wrote a few years after the election and was also turned into a film, barely mentioned these events. Friends have said that after a brief period of personal reflection, he chose not to look backward and instead center on what he was going to do next. Gore has developed a series of self-deprecating jokes he uses at public events to acknowledge the issue, signal to people that he’s willing to laugh about it and move on, and that he wants the audience to move on as well. It’s possible that thinking can affect more than just your own feelings and behaviors and how others perceive you. For more than a century, a series of writers and thinkers have postulated something called the law of attraction. To put it in very simple terms, the law of attraction says that your thoughts control the reality of your life, whether you realize it or not. In effect, if you want to achieve something and truly believe it’s possible, it will happen. This idea was promulgated by the New Thought Movement back in the early 1900s, the Theosophists after World War I, and has received renewed attention thanks to the recent film The Secret and various follow-up books. In 1952, a New York City minister named Norman Vincent Peale published a book that suggested another linkage between what you think and the facts of your life. The Power of Positive Thinking outlines a process which he said would remove all negativity from life. One of Peale’s most famous aphorisms was that “thoughts are things,” and he preached that thinking and repeating positive statements aloud would cause positive things to happen. Less formally, many business and sports coaches urge their charges to visualize success: to think about how a successful sales call would transpire to picture themselves hitting a home run off a curveball. These philosophies, and others like them, have devoted adherents and determined critics. Millions have found The Secret to be helpful while others say it leads to a “blame the victim” approach. Peale has been lionized by presidents and also criticized as a practitioner of self-hypnosis. Hundreds of major leaguers spend time visualizing successful at bats, while others think that’s time that could be better spent actually in the batting cage taking practice swings. I don’t know where the truth lies in all this. I’ve found some of these beliefs helpful at times but none of them to be a panacea. If they work for you, great. Just don’t make the mistake of believing that thinking can take the place of doing. Even if you’re naturally blessed with the kind of positive attitude exemplifi ed by Pat Mitchell, Ryan Scott, and Kay Koplovitz, you can’t count on instinctively responding so positively to every curveball. Stepping up to the plate is a learned response. It’s only through practicing it, time and time again, that it will become reflexive. Once again, consider taking your lead from Cognitive Behavioral Therapy. Work on developing a new way to think about something, and then consciously apply that new attitude. Your new attitude toward curveballs should be: “What should I do?” Make it your mantra, not just in business, but in life in general. Just as the 1992 Clinton presidential campaign famously hung a sign in their headquarters reading “It’s the Economy, Stupid!” so you should, literally or figuratively, hang a sign in your office reading “What should I do?” Post the question on your computer, on your cell phone, and put it on your wallet. If you have to, inscribe it on a bracelet and keep it on your wrist. Suggest it to your friends and coworkers. Preach it to your spouse and children. Make it a conscious part of the way you approach your day-to-day life. Think of it as batting practice for when you really do need to step up to the plate. Use it when facing the small curveballs in life. If you find that your car won’t start one morning, ask yourself, “What should I do?” Say your friends unexpectedly bring their children to a dinner party—just ask yourself, “What should I do?” Perhaps your computer crashes one afternoon—simply ask yourself, “What should I do?” The more you make this way of thinking a part of your everyday life, the quicker you’ll become someone who routinely hits the big business curveballs. Having developed and internalized a new way of approaching curveballs, you now can follow Insana’s advice, stay in the game, and move on to overcoming pessimism and embracing realism, realizing that you’re the batter, not the ball.